While 3D imaging has become a revolution in land archaeology, it has experienced a difficult baptism underwater. Electrical equipment and water do not mix, plus many systems do not easily transfer underwater when you add currents, visibility issues, and salt into the equation. Approaches that have been attempted include acoustics, laser-based systems, and photogrammetry with each of these having varying success depending on site conditions. A new promising system is an underwater structured light system designed by a group of engineers from University of Kentucky and TrioVerse. Structured light systems have a high degree of accuracy, but usually require a stable projector and camera, as well as an on site computer. As I mentioned in my previous blog post, structured light works through projecting a pattern onto a surface, much like sunlight coming through Venetian blinds and bending over furniture. These bends are captured by a camera and the difference between the photograph and the original pattern is calculated by the computer to create a 3D model. This is not the kind of system that would seem practical 30 metres below an active Mediterranean harbour or inside an underwater cave. However, Dr Larry Hassebrook and Eli Crane have developed a novel system from working with archaeologist Dr Chris Begley (Transylvania University). Chris works in remote jungle locations along the Mosquito Coast that are hardly conducive to electronics. To suit this extreme environment Larry and Eli completely rethought structure light systems and built an essentials-only scanner that allowed all the processing to be done upon returning from home from the field. After several successful trips into the jungle with this minimal complexity scanner, Larry, Eli and Chris turned their thoughts toward building an even more compact version that was watertight for use on underwater sites. Larry and Eli showed me the eight-pound prototype while on a project scannning Bronze Age mortuary caves that Chris and I were co-directing with the Ecomuseu Cap de Cavalleria in Spain. Lightweight and easy to manipulate, the system can be operated by a single diver. The scanner has the same limitation as other structured light systems, namely it required darkness for the projected pattern to appear; however, the engineers found that underwater this less of a problem the deeper you go. Over two weeks of diving, we tested the scanner in several conditions, including in daylight at various depths, during night dives, and in the darkness of the cave system. A wide range of artefacts were scanned including ancient and modern anchors, amphoras, a sarcophagus, and even geological formations like stalagmites and stalactites. The system is still in development, but the prototype’s results are very promising. Take, for example, the photographs and model of the amphora. 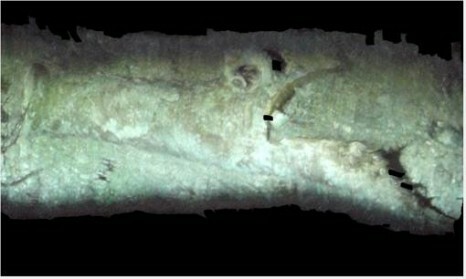 The 3D data shows the distinct shape of the amphora, which is distinguishable from the background environment. 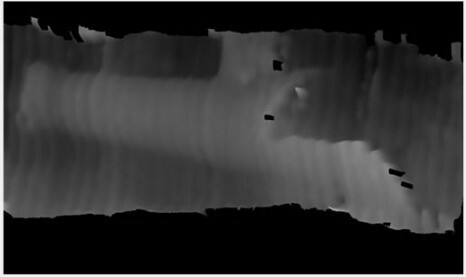 The model does have spatial division modulation noise, but this noise can be corrected through a calibration algorithm in the future. Like all camera-based systems, it require moderate to good visibility, but it will offer a higher degree of accuracy than photogrammetry systems. With only a little training, a team of divers could survey a coastline while recording finds in 3D. The system allows for repeated use over many dives while only using AA batteries and a standard memory card. Cheap and easy to use, this systems holds great potential for underwater archaeology. 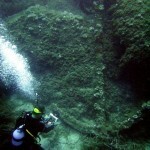 If you are interested in 3D underwater imaging then be sure to check for updates at www.TrioVerse.com. Peter is a PhD student at University of Southampton researching social aspects of maritime technology. He is also head underwater archaeologist for the Cave Archaeology Investigation & Research Network (CAIRN) and archaeological Director-at-Large for the Albanian Center for Marine Research. Peter is a Federal Qualified Principal Investigator (US) in maritime archaeology and listed on the Register of Professional Archaeologists (RPA).